This is a two storey villa of 357m2. High quality furnishings in Asian style, definitely leaves nothing to be desired. The large saltwater pool (no smell of chlorine & especially kind to the skin), faces south. It can be heated via a solar heater or a particularly economical heat pump. 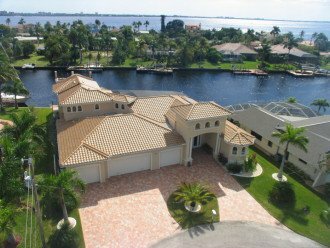 The view from the pool deck is amazingly beautiful as the villa is located on one of the widest canals in southeast Cape Coral. Even better is the view from the observation deck, which is located above the bedroom, on the 1st floor. From this cozy spot, you can watch the sun set in the river. In the house itself, including all bathrooms, travertine stone is laid. The owners have saved nothing in the construction of the house. Everything is high quality and very tasteful. The living area is completely open and can be opened with 9 meter sliding doors. Whether you sit inside, and still feel like outside, or outside, and yet you are close to the action in the house, you always feel in good hands. The villa is particularly suitable for several couples or families with older children, because you can sometimes go out of the way because of the construction. Each room has its own outdoor area, with a separate sitting area. Of particular note is that The Beachwalk offers above average privacy. Both neighboring houses have their pool and seating area aligned to the other side. This makes you alone and gets from the neighbors hardly anything. 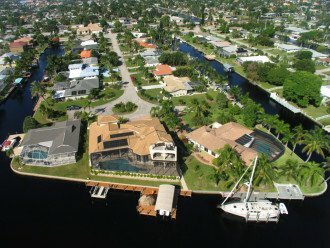 It is located in the so-called Yacht Club area and is one block from the river. The river can be reached by boat in just 2 minutes. 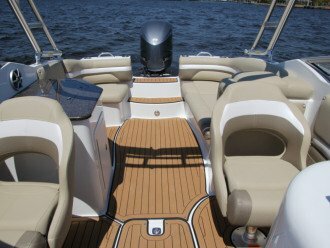 It is an absolute top location for boaters. The water is not as rough as on the river, but you still do not have to go long distances across the canal. A boat gas station is just around the corner. But not only for boaters, the location of the villa is ideal. 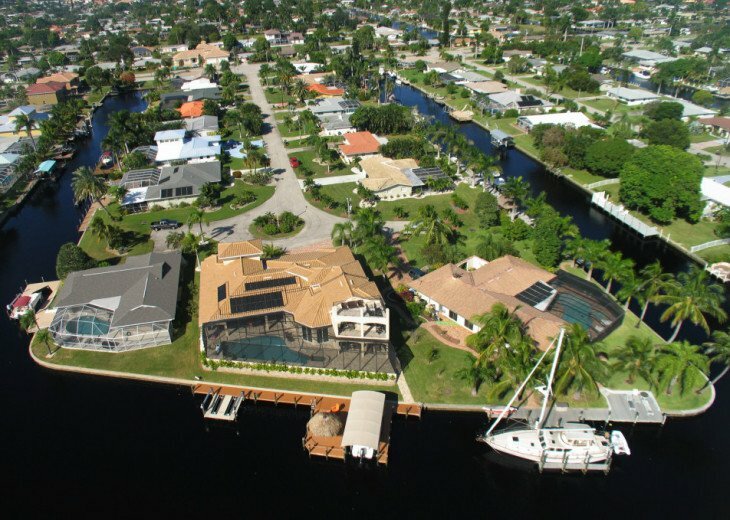 The beach of Cape Coral and the restaurant "The Boathouse of Cape Coral" can be reached on foot. All shops for daily use can even be reached by bike. The house is in a dead end. This guarantees absolute peace. In the evening you will only perceive calming things from nature. 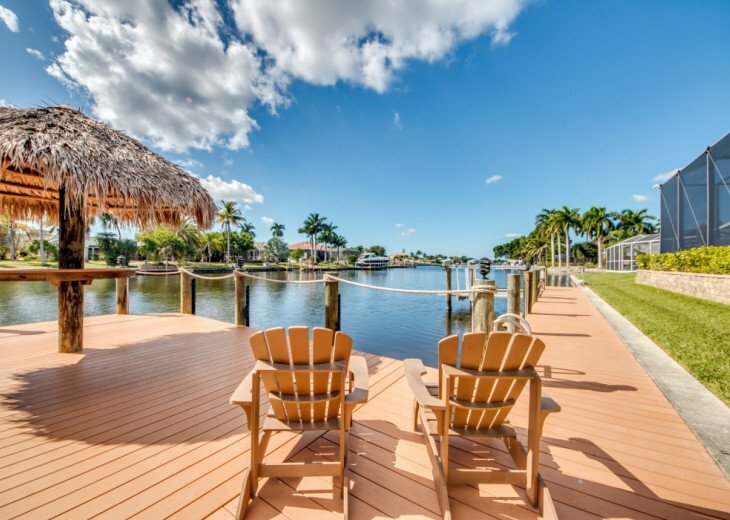 Due to the proximity to the river, guests will often see dolphins. 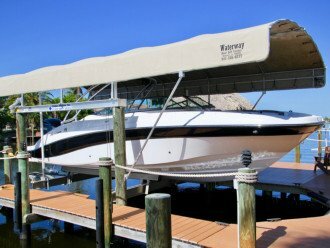 These regularly hunt for fish under the adjacent boat docks. 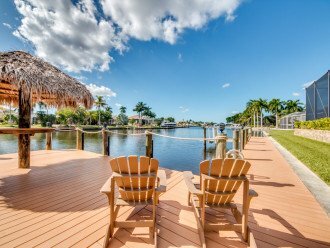 With a little luck, you will also be able to observe manatees, as they often graze in the channel. The 12-meter-long pool with 3 built-in bar stools has an outdoor hot tub. If you want to swim properly, then you can do so thanks to the strong countercurrent system. The villa has 3 separately adjustable climate zones, each with its own temperature. Facebook and Co. can be used on all TV sets, because all TVs have a Smart TV interface. You do not need a computer. Each TV has a hard disk player that is filled with a lot of movies and series. You can watch German TV live or access the TV program of the last 14 days. Throughout the house and also on the terraces, a Sonos system is installed. You can listen to the same music in the entire house or in the outdoor area, or you can also control each room individually. In the Sonos system you can integrate your own Smart Phone. If you do not have a smartphone, then you can use the iPad available in the house. If you do not want to use the Sonos system, then you can connect an Iphone to the music system via the docking station installed in the house. Barbeque fans will enjoy the Weber Genesis 600 Grill. This will make your steak especially crispy. Should boredom arise in spite of everything, then just play a game of pool or use one of the board or card games available in the house. 4 kayaks are also available for free. Explore the channels and stay fit. No Smoking - The villa is strictly non-smoking. Pets are not allowed in the villa. 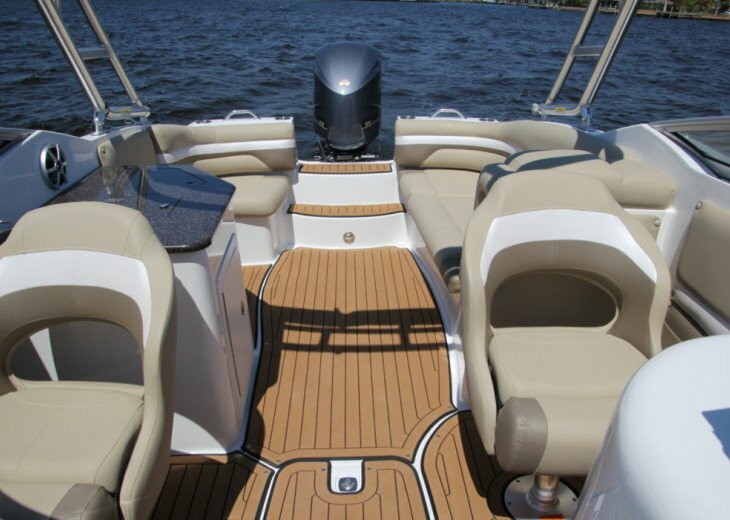 A boat can be rented at the time of booking. 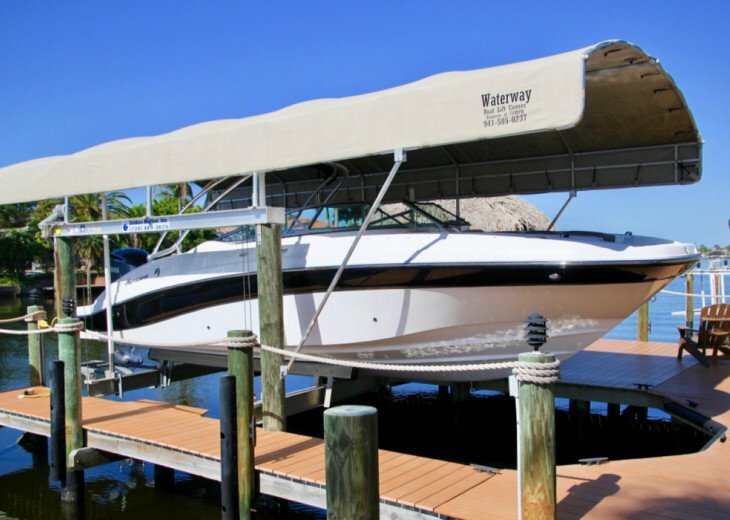 The existing dock with boat lift is only available for own rental boats.